Syanis Vargas-Gonzalez landed a role in the ROC Players musical Spring Awakening and is taking voice lessons at the Eastman School of Music. Mariana Ortiz and Adriana Santiago are playing club volleyball. Claudine Daneri has joined the Medallion Leadership Society and the Undergraduate Finance and Economics Council. And Brian Basu belongs to Model United Nations, UR Debate Union, College Democrats, Meliora Capital Management, and UR club water polo. He’s also in the running to oversee this spring’s Students’ Association elections. 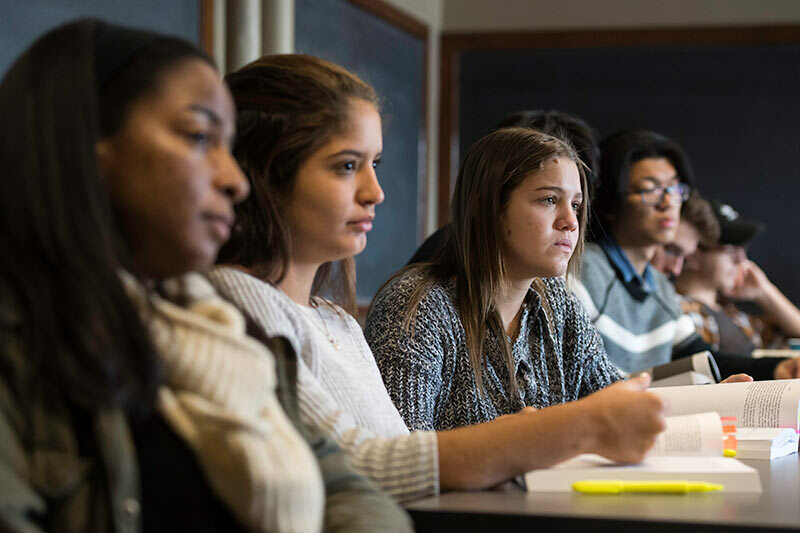 The students are all in their first or second year of college, and all are Puerto Rican natives except for Daneri, who was born in the Dominican Republic. All seven are taking classes at Rochester while their colleges in Puerto Rico were damaged or closed following the devastation left by Hurricane Maria last fall. Joe Latimer, assistant dean for enrollment diversity and outreach, says the guest semester is a way for the University to help the students to keep their academic programs on track. 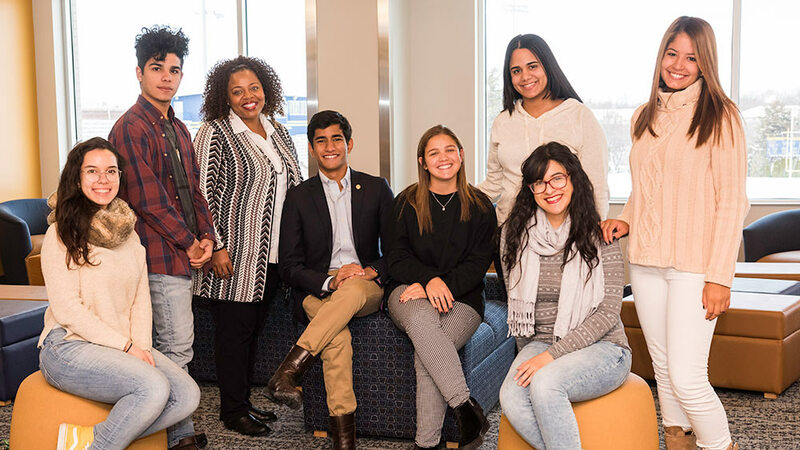 The students are: Ortiz (pre-law), Basu (political science), Gonzalez (music), Santiago (biology), Daneri (economics), Andrea Rosado-Quinones (biology), and Joshua Rosario (psychology). They arrived in mid-January, and are staying in residence halls on campus. All credit hours they earn this semester will be transferrable to their regular colleges. Dawn Bruner, Rochester’s director of Parent and Family Relations, is their advisor and meets regularly with them to answer any answer any questions. She helped plan their class schedule to match their majors back home. Latimer says several departments across the University worked together, and University alumni raised money for living expenses such as books, supplies, and meal plans. Jeffrey Runner, dean of the College, says it was “an easy decision” to offer the guest program. The students from Puerto Rico tell harrowing stories of when Maria, a Category 4 hurricane, crippled the island in September, leaving hundreds dead and more than a million homes without power. Ortiz and Santiago, San Juan natives and friends since childhood, were students at Universidad del Sagrado Corazon at the time. The students talk of “hurricane-proof” windows exploding, houses without roofs, mudslides, trees splitting and shedding all their leaves, and people running out of gas while waiting hours in line to refill their tanks. 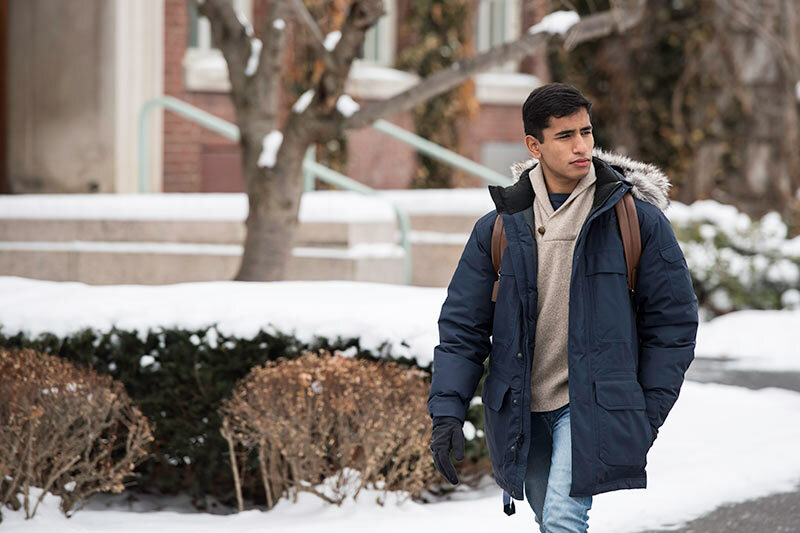 The University’s offer was a chance to escape—and continue. 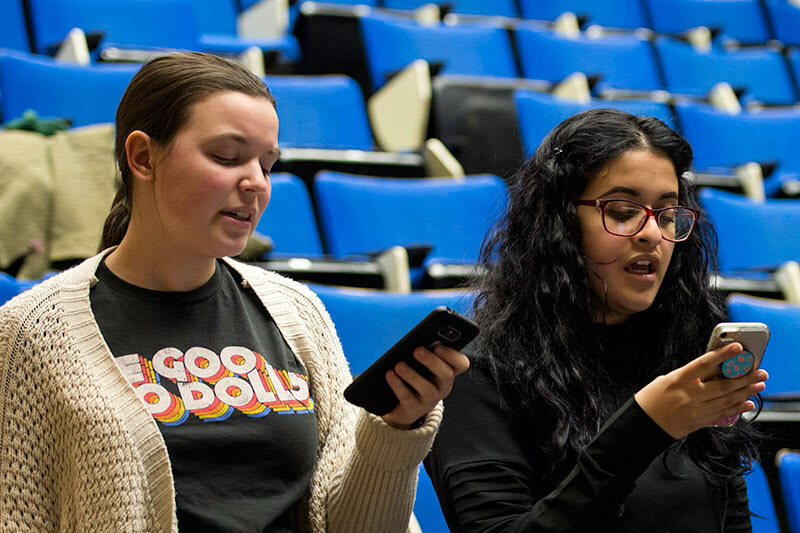 Gonzalez, like Basu a student at Universidad de Puerto Rico-Rio Piedras, is thrilled to be taking voice lessons at Eastman after passing her audition. The first-year student has joined a gaming/computer club and a linguistics club. Some of their experiences at Rochester are entirely new. Three students, for example, had never seen snow before. The effects of Hurricane Maria won’t soon be forgotten by these students. Neither will their time at Rochester.